I recently had the opportunity to attend a most unique festival called Dungar Dev Puja. Every five years, an entire village or a family lineage comes together to pray to the God of their hill. Their belief is that the Hill God protects their crops and their families from droughts and diseases and ensures overall good health. The uniqueness of the festival, however, lies in its customs. Dang district is located in the southern fringes of the state of Gujarat. It has 98% tribal population and 70% forest cover. It forms one end of the Western Ghats and thus, is also host to the only hill station of Gujarat, Saputara. Due to the lack of irrigation systems, most of the farmers of the district can only grow crops in the monsoon season. 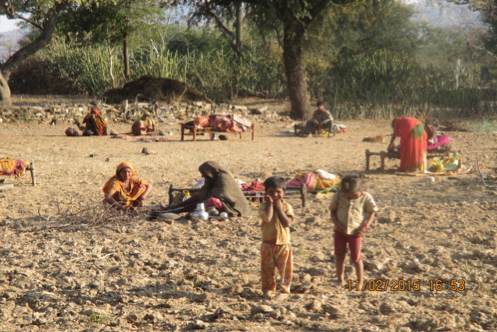 The poor farmers are subject to distress migration during the other months, when they have to travel to Shirdi and other nearby towns and cities in search of livelihood. My project, developing rural tourism, aims to generate income for the local farmers by employing them in this commercial tourism venture. As Bhaskar Bhai and I wound our way through the cold December night to reach the Nawagaon hilltop, we were welcomed by slow meandering notes of an instrument and eerie singing voices. As the spectacle unfolded, I noticed writhing bodies dancing around a fire, high shrieking laughter, sombre women holding plates of offerings and lamps and people playing strange instruments and singing. Bhaskar Bhai explained the entire setting before me, “This is a special night for these people. It is the night that the spirits of the hill enter their bodies.” Against the backdrop of a dark Saputara, ancient rituals ensued. Bhaskar Bhai went on, “When these spirits take hold of a body, the man becomes infallible. We have seen men break stones with their own foreheads, walk on burning coals and lie on prickly thorn branches.” I simply stood startled for the first few moments, not knowing what to expect. A young screeching man came close, as I watched hesitantly. Without warning he shifted some burning logs, revealing smouldering ashes and splinters of burning wood. I remembered roasting tomatoes in my camping trips, on such glowing ashes. And he went on to trample these glowing ashes in brazen fury with his bare feet, howling into the night, before pausing and rejoining the singing dancing procession. Barely had I gathered myself that a bare-chested young fellow flung himself into a cluster of thorny branches, only to emerge visibly unhurt. All of them, one way or the other, corroborated the presence of the Dungar Dev spirit. While the young men continued to revel in their possessed state, it was the music that really drew my attention. Two instruments were used, the Pavri and the Thadi. A Pavri is made out of the shell of a bottle gourd and horn of an Ox, decorated with peacock flowers and played by blowing into the mouthpiece. The sound of the Thadi is created by slowly running your fingers over the hollow stem of a ‘Sir’ plant that is placed on a metal plate with a small sheath of a beehive connecting them. While the Pavri is responsible for a throaty concoction of variable pitches, it was the sound of the Thadi that set the eerie undertone for the night. The surreal resonance of the two unusually talented singers from Maharashtra and their Thadi playing will remain with me for some time to come.